This study explores the impact of the usability of E-commerce websites on user satisfaction and provides a reference for designing and assessing E-commerce websites, with the aim of improving websites usability for enterprises. This study proposes research hypotheses on the impact of the usability of E-commerce websites on user satisfaction based on Microsoft’s usability guidelines. In addition, the weighted scores and correlation analysis are used to test the hypotheses. One hundred and twenty three participants were selected for filling out questionnaires. Some countermeasures to improve E-commerce websites from the perspective of website usability are proposed in the end of this paper. The usability of web content, personalized services, and emotional states have the greatest impact on users’ satisfaction, which provides the relevant theoretical guides on usability construction of E-commerce websites. 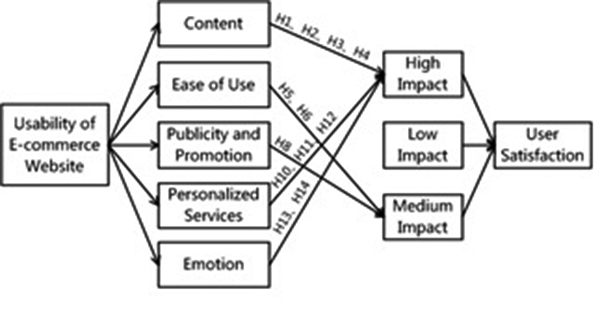 M. Shi and H. Yuan, “Impact of E-Commerce Website Usability on User Satisfaction,” J. Adv. Comput. Intell. Intell. Inform., Vol.23, No.1, pp. 91-96, 2019. Y. Che, “Usability of E-commerce website,” J. of Anshan Normal University, Vol.8, No.4, pp. 71-73, 2006. D. Belanche, L. V. Casaló, and M. Guinalí, “Usability, consumer satisfaction and the intention to use a website: The moderating effect of perceived risk,” J. of Retailing & Consumer Services, Vol.19, No.1, pp. 124-132, 2012. E. Grigoroudis and Y. Siskos, “Customer Satisfaction Evaluation: Methods for Measuring and Implementing Service Quality,” Springer, 2010. T. P. Anjos and L. A. Gontijo, “Usability Tool to Support the Development Process of e-Commerce Website,” Int. Conf. on Human-Computer Interaction, pp. 11-18, 2017. R. N. Cardozo, “An Experimental Study of Customer Effort, Expectation, and Satisfaction,” J. of Marketing Research, Vol.2, No.3, pp. 244-249, 1965. S. Lee and R. J. Koubek, “The effects of usability and web design attributes on user preference for e-commerce web sites,” Computers in Industry, Vol.61, No.4, pp. 329-341, 2010. G. Sahi, “User Satisfaction and Website Usability: Exploring the Linkages in B2C E-Commerce Context,” Int. Conf. on IT Convergence and Security, IEEE, pp. 1-4, 2015. L.-Y. Li and L.-Y. Lee, “Experiential Consumption and Customer Satisfaction: Moderating Effects of Perceived Values,” Int. J. of Marketing Studies, Vol.8, No.5, pp. 32, 2016. P. Mitrevski and I. Hristoski, “E-Consumer Online Behavior: A Basis for Obtaining e-Commerce Performance Metrics,” Vol.83, pp. 142-151, 2011. J. Lam and M. Lee, “A Model of Internet Consumer Satisfaction: Focusing on the Web-site design,” AMCIS 1999 Proc., p. 182, 1999. J. Eighmey, “Profiling user responses to commercial web sites,” J. of Advertising Research, Vol.37, No.3, pp. 59-66, 1997. S. Arya and S. Srivastava, “Effects of user’s primary need on relationship between e-loyalty and its antecedents,” Decision, Vol.42, No.4, pp. 419-449, 2015. G. Suchacka and G. Chodak, “Using association rules to assess purchase probability in online stores,” Information Systems and e-Business Management, Vol.15, No.3, pp. 751-780, 2017.